I am thrilled to be guest co-hosting the brilliant new #FamilyFun linky this week. #FamilyFun is hosted by Catie over at Diary of an Imperfect Mum every Thursday. This week is extra special as she is launching her new linky badge design! What do you think? I hope you all like it… it’s one of my doodles and I couldn’t quite believe that Catie wanted to make it the #FamilyFun linky badge! What an honor. My favourite post from last week was Belonging to a Social Media tribe by Jade from The Parenting Jungle. If you have yet to find your tribe you won’t want to miss this post. Catie’s favourite post from last week was ‘But Mum is There Wi-Fi?’ by Helen from JUSTSAYINGMUM. 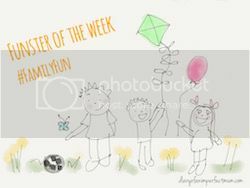 If you have been featured, please do grab your funster of the week badge below. The #FamilyFun linky is a great place to link up your family and parenting posts old and new. Maybe you have an experience, day out, review, crafty or foody post or 2 that you would like to share. All posts are welcome and we hope that you will get involved in the linky community by commenting and tweeting on reads that you have really enjoyed. The linky will be open from 6am Thursday – midnight Saturday GMT. We will comment on all linked posts. Join us in our goal to have more Family Fun. 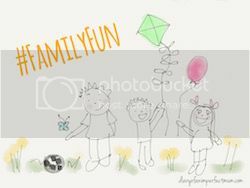 Add the Family Fun badge to the HTML / Text portion of your post. If you need any help linking up, read the fabulous Linky Guide from Cuddle Fairy or tweet (@animperfectmum). Please comment on a host post, the co-host post & one other of your choice. Feel free to comment on more! Share the love and you get it back. By entering the link you are agreeing to be added to an email reminder list. You can request to be removed at any time! "Inspire teamwork in your family"